We appreciate hearing from you when your children are going to be absent, especially if their absence is due to an illness. This communication allows us to help plan for the day and track illnesses which may be contagious for others in our community. Our nursing staff is an integral part of the total quality care philosophy. Our school nurse meets all of the medical needs of your child and the Center, including dispensing medication, tracking illness, handling injuries, and caring for mild to moderately ill children while awaiting your pick up. All of these services are included with your monthly tuition. For those times when your child is moderately ill, we provide on-site health care. The Special Health Care Unit is available at a small additional cost. 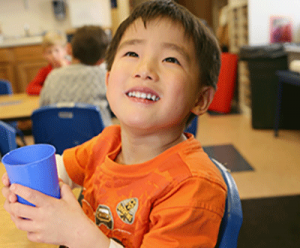 A Nurse lovingly cares for the child who is unable to participate in classroom activities. Food Service as Good as Homemade! All meals and snacks served at The Children’s Center are prepared in our own kitchen with special effort given to avoid artificial flavors, colors and preservatives whenever possible. We provide a wholesome and nutritious lunch and two daily snacks. In addition, a simple breakfast is available for children arriving in the early a.m. Foods with excessive sugar and salt are avoided and fresh fruits and vegetables are served daily. Special dietary needs can also be accommodated.